I started going through the seed catalogs last weekend, trying as best as I could to stick to my list. I needed to order peas, radishes, and potatoes. I also needed tomato and pepper seeds for indoor sowing. Before I knew it, my pen was a' flyin', circling this and that, and, oh... don't I need to buy a few flower seeds, too? I could hear the "cha-ching" of my escalating bill. Hmm. Maybe I should assess my existing seed stash first, before I get carried away? I keep my seeds in an old potato chip container. It's so packed full that I almost can't close the lid on it anymore. I've got seed packets in there from when I started gardening four years ago -- many of them still unopened. How did I end up with so many seeds? It's almost too much, even for a pack rat like me. I dug deep into the well of seeds. Did I say I needed to order peas? I found two packages in there -- unopened. Radishes? I found five packets of those, in three varieties. Lettuce? Have I ever got lettuce. And, oh yeah, there are those fava beans I ordered last year and never planted. I'd forgotten about those entirely. Long story short, I haven't placed a seed order yet because I already have enough to start with. Seeds that are a couple years old still germinate well for many plants, so there's no need to buy too much more. Although... yes, I do plan to treat myself to a few new things I want to try, keeping in mind that I still have to dig those garden beds! 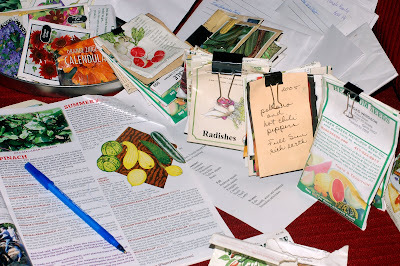 In the end, I sorted some of my vegetable seeds into groups and clipped them together with binder clips. There's one set for sowing outdoors in early spring, another set for sowing indoors under grow lights, and so on. This should help me keep track of what needs to be planted at different times, and I won't have to swim through the sea of a seed bucket every time I need to find something. This is the most organized I've been with my seed sowing endeavors. Ever. Wow, you have been busy. I have still managed to buy a lot of seeds this year that i said i wouldn't, justifying it by saying that last years seeds can not be viable still, when i know they almost all will be! A good way of organizing the seeds tho, so that you know what to sow when. Mine need to be much better organised! I really like your binder clip system --I may try to emulate that! I am proud of you! No need to order more when you already have everything you need. Good luck with all of the seeds. That must be one hell of a potato chip container! Wow, that's a ton of seeds. I thought I had a lot. You have some great varieties in there! I haven't ordered any vegetable seeds this year but I've ordered flower seeds. Good luck with your seed sowing. It's great to be so organized (I think, because I can't say "I know." ;-) Maybe you'll be the inspiration I need! 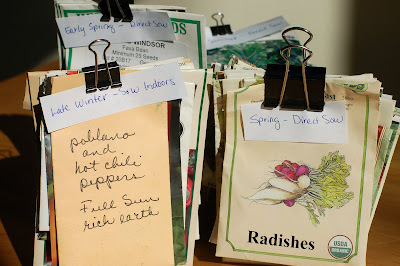 Wow, organizing seeds with clips. I am needing to get my seeds out and look through them too. I like the potato chip container idea. Better than my seeds in a walmart bag. Maybe I can convince my Dad to build me a seed packet storage bin. He has tons of cedar fencing he finds when driving down the road and people are redoing their fences. It's amazing what he can do with the cedar planks and supports. First of all, I have never heard of a potato chip container before. The only potato chip containers I have are bags and I go through them quite quickly. I think many gardeners go through this seed packet build up dilemma. I know I do. One year I just took all my old packets and through them all over my garden just to see what would happen. Not many came up but some did and they keep coming up year after year and I can't tell you what the !@! @## they are. I don't suggest this method. Chigiy, LOL! I've often thought of throwing all my unused seeds in a corner of the garden to see what would happen. I can imagine how that approach could get messy! About the potato chip tin... There's a local company that makes kettle chips and this was a gift container they came in. I can't even buy potato chips anymore because it's too tempting to eat an entire bagful in one sitting. Weakness! Pack rats of the world, unite! Just as soon as we can find our car keys under that pile of seed & plant catalogues. :^D Congratulations on your reorganizing. Saving money is a good motivator. Great organization tip. I've started trying to save as much as I need and swap my extras for the few things I am looking for at a time. That has helped me cut down on my seed excesses. It also is fun to connect with people all over who may have experience growing that one unusual variety that you'd like to experiment with. Isn't is such an exciting time of year, all this planning? This is so much like me as far as buying and 'collecting' seeds, though you do have more than I do. I have to say you're incredibly organized and I love the way you use the binder clips as an organizational tool. Lovely handwriting too. Nice job! You can certainly pat yourself on the back! 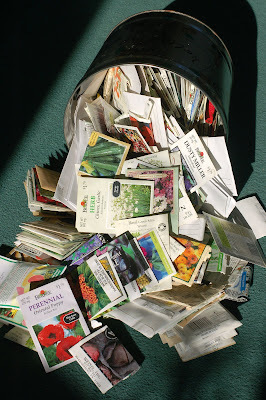 Every gardener's dilemma - all those seed packets competing with the seed catalogue each spring. It's good you are going with your old seeds - they deserve a chance to show their stuff! You have lovely writing, BTW! Grat photos - as usual! I managed to give away all 100+ seed catalogs I've gotten in the past 18 months at our recent Seed Exchange along with tons of seed pcakets I've accumulate and seeds I've gathered from the garden. Sp I'm almost starting for a clean slate again -- I tend to grow on impulse and direct sow rather than start indoors - so what I come across the spring and what strikes my fancy will be what ends up in the ground. there's nothing like playing in soil in the middle of a snowstorm, and with all those seeds - what have you got to lose?! I love the way you organized those packets. I don't have quite as many packets as you do (mostly because I gave a bunch away last year) but I'm definitely not as organized as I'd like to be... so I may have to borrow your idea! Good for you! I did the very same thing this weekend, though I don't have quite as many hoarded seeds as you do! My indoor seeds are in their little squares staying warm, and my other outdoors are waiting patiently for about 6 more weeks here in Austin. You're right, we don't ALWAYS have to shop to garden!!! Wow, what a delectable photo of the pot o' seeds. I'm all drooly!